The Zimbabwean dollar (Z$) was the official currency of Zimbabwe from 1980 to April 12, 2009, with three periods of inflation. It began as the highest-valued currency units in the region when it was introduced in 1980 replacing the Rhodesian dollar at par. However, soon political turmoil unfolded and the CONFIDENCE in the government collapsed. 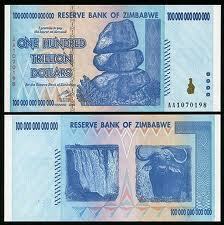 This became manifest in hyperinflation.The Z$ underwent three redenominations, with high face value paper denominations, including a $100 trillion banknote . The third redenomination produced the “fourth dollar” (ZWL), which was worth 1 trillion ZWR (third dollar), or 1025 ZWD (first dollar). Despite attempts to control inflation by legislation, CONFIDENCE in the government was nonexistent. Three redenominations (in 2006, 2008 and 2009), failed and the end result, the power of the government simply collapsed insofar as its authority to even issue money. Effectively, the Z$ was abandoned on April 12, 2009 in the midst of the global financial crisis due to the lack of confidence and skyrocketing inflation. This end result of the Reserve Bank of Zimbabwe was forced to legalize the use of foreign currencies for transactions in January 2009. In other words, they function only using the currency of other governments. Japan went through a similar period where its government was no longer trusted and people resorted to barter using rice for money.The Japanese government simply stopped issuing any coins (money) for 600 years. « Can Patterns Target Individuals?